The Western Grebe, (Aechmophorus occidentalis, is a species in the grebe family of water birds. Folk names include dabchick, swan grebe, and swan-necked grebe. A paleosubspecies, Aechmophorus occidentalis lucasi, has been described from the Late Pleistocene of SW North America. As Clark's Grebe was not considered a separate species until the 1990s, it is not completely certain that the fossils are correctly attributed to A. occidentalis vs. A. clarkii. This is the largest North American grebe 56-74 cm (22"-29") long. It is black-and-white, with a long, slender, swan-like neck and red eyes. 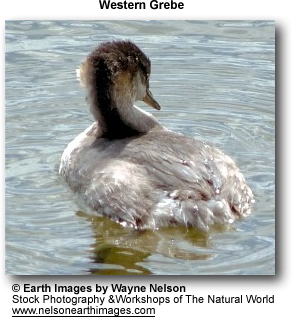 It is easily confused with Clark's Grebe, which shares the same features, behavior and habitat, and hybrids are known. 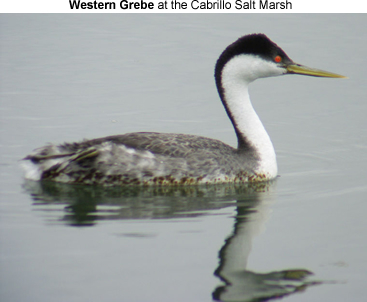 The Western Grebe has black around the eyes and a straight greenish-yellow bill whereas the Clark's Grebe has white around the eyes and an up-turned bright yellow bill. The downy young of Western are grey, Clark's downy young are white. Western Grebes nest in colonies of hundreds on large inland lakes, sometimes using coastal marshes, in western North America. It has a spectacular courtship displays; two birds will rear up and patter across the water's surface. Northern birds migrate west to coastal ocean in winter; birds in the southwest and Mexico may be permanent residents. This bird dines by diving for carp, herring, mollusks, crabs, and salamanders.